Shoes | Ooh, my favorite! 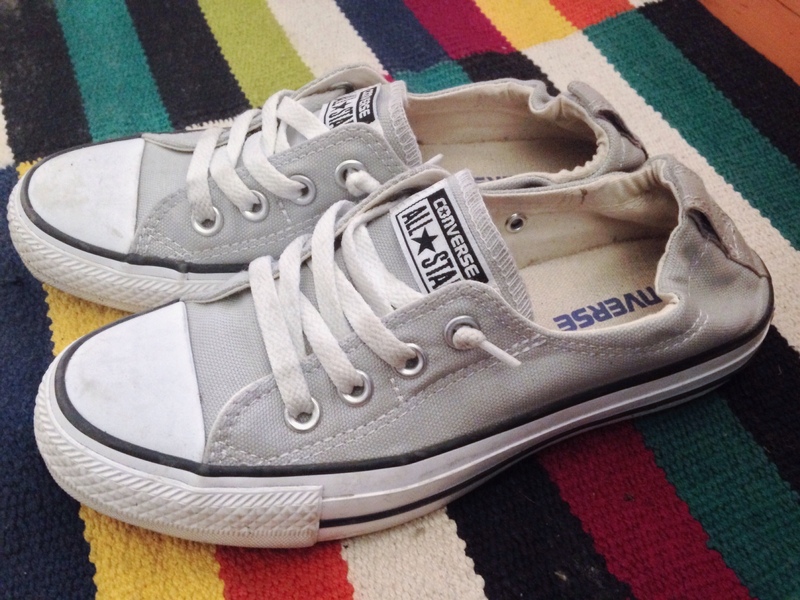 I’ve always loved traditional Converse, but they’re even better with the ease of of an elastic heel and no laces to be tied. Slip-on, runaround, cute. Ever since I nabbed these vintage Swedish clogs (for $45 bucks!) I have been the crazy clog chick, wearing them around the yard, for errands to the grocery store, and lunches with friends. But since I mostly wear them around the chickens, and the chances of chicken poop contact is pretty high, I decided I should look for a pair to wear exclusively for outings at my favorite restaurants. I stumbled upon Swedish Hasbeens, and while they’re nothing new they are popping up on a lot of stylish ladies. At first glance I thought they’d go the route of folksy but when you see the way SJP styles them you’d never make that association. There are lots of other images of her wearing them around town and they’re always the perfect pairing for city jaunts. They’re also great because the leather is tanned with vegetable oil and not the toxic chemical chromium, and they are made in small Swedish factories, by hand, using vintage techniques. Pointed toes are back! My piggies may not be happy but my wallet is because, between mom and I, we’ve got plenty in the archives. I must say though, the ankle strap guys from Alexander Wang are lookin’ mighty fine. The textures from the Alice & Olivia’s are fun and the silhouette looks great, but these are definitely see-in-person territory. Fantasy all-purpose, float around town, lunch date, dance party, oh the things I would do for these shoes. Saint Laurent, $1195. Reality float around work, bar service, dining room dash, oh the things I have to do in these work shoes. Dansko, $70. We have yet to have our first snow and somehow these are all I can think about. My mind is somewhere on a tropical beach, and my feet aren’t really that psyched to squeeze into another pair of boots. I rocked my espadrille sandals to the absolute limit the past two summers, so I suppose I should start looking to replace them…even if these are a little more ooh la la. I love the volume of the lambskin tie around the ankle and because of that I would actually prefer to dress these down. I can envision these with distressed black skinnies and a nice cozy tee. Sigh. I have to be honest and confess that the white winter boots I gushed about a few weeks ago have more than completely lost their luster. In fact, I’m going to have to ask you to forget that I ever posted them. 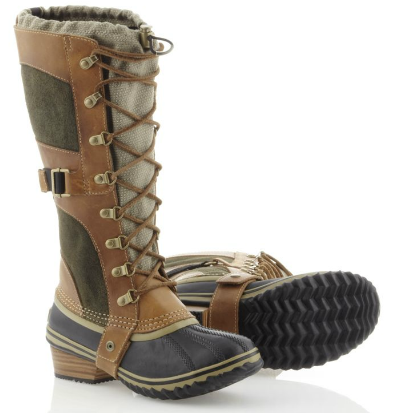 Knowing I needed to order some outdoor boots, I glanced at them the other day and only saw pictures of strippers with matching faux fur coats. So, yeah. Let’s forget about that whole thing. THESE are the boots I should have found sooner. Part of SORELs fall line, Get Your Boots Dirty is a line for women “who aren’t afraid to create, to accomplish, to do. They’re made with purpose, for those with purpose.” I like it, and they’re precisely what I need for my little adventure this week…. I’m a little later than usual today, but I was out preparing for a foraging and farming excursion for the next couple of days. REI does not even rank on my list of pleasurable shopping experiences, but thankfully I received these SORELs Conquest Carly’s on Friday and have been dying to wear them on my adventure, and around the city too. They really are that stylish that I’ll be able to traipse around in them all autumn and winter. I love the idea of having purpose, functionality, and style. These have it all. Since when did Narciso Rodriguez get into the shoe game? How did I not know this? These. Right here. To die for.